The BBC will show the World Cup quarter-finals games involving France and Netherlands live on television. Former Manchester United midfielder Paul Pogba will be in action when France take on Germany at 17:00 BST on Friday, 4 July in Rio de Janeiro. Netherlands will meet Costa Rica in Salvador on Saturday, 5 July at 21:00 BST. 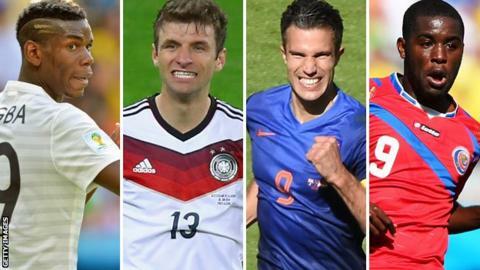 You can follow all the action from the quarter-finals phase of the 2014 Fifa World Cup with the BBC across television, radio and online. Matches will also be shown live on BBC television and online throughout the remainder of the tournament. There will be live text commentary on every knockout match at the World Cup, available on the BBC Sport website and app for mobile, tablet and BBC Sport Connected TV App. BBC Radio 5 live will also be continuing to provide live coverage and analysis of every match.